The Nebraska Pro by HAIX provides you with all the support you need whilst carrying out activities such as forestry work, gardening or mountain hiking. Its Vibram sole is manufactured in a special rubber compound and has been specially designed for use across Alpine terrain. The form and height of the tread have been precisely planned to fit the shape of the boot. This will prevent slipping on uneven and stony pathways. The sole of the Nebraska Pro is particularly stable and durable. It reduces discomfort from individual pressure points created when you walk across small pieces of rubble. The tread also facilitates optimum toe-to-heel movement and thus decreases the strain on your joints. The Nebraska Pro by HAIX can deal with various weather conditions that may occur on your mountain trip. The nubuck leather used in the manufacture of the boot has been hydrophobised, i.e. chemically treated so as to be water repellent. The Nebraska Pro also features an integrated four-ply GORE-TEX® membrane. This prevents the penetration of any liquids whilst evaporating and expelling sweat to ensure that your feet stay dry, even on hot summer days. An abrasion-resistant inner lining features an inner layer of fleece to offer perfect climate comfort all year round. The Nebraska Pro also features the HAIX Climate System. The pumping movements generated as you walk along transports moisture to the shaft of the boot in order to be expelled. In order to undertake long and strenuous mountain trips, you need a hiking boot that sits perfectly. The Nebraska Pro achieves this via the benefit of a dual-zone lacing system. The foot and calf areas of the boot can be fastened to different tightnesses in order to provide an outstanding fit. The HAIX Nebraska Pro is manufactured in oiled nubuck leather. This is a particularly durable and water-repellent material. Abrasion-resistant rubber over the toe cap and in the heel area helps prevent wear and tear, whilst an innovative two-zone lacing system enables the boots to be ideally adjusted to your feet and calves. Hooks stop the laces from working their way loose during work or hiking activities. A four-ply GORE-TEX® membrane prevents penetration by raindrops. At the same time, the high level of breathability offered by this material allows sweat to be evaporated and expelled. This means that your feet will remain dry throughout the year. The inner lining of the Nebraska Pro is also highly abrasion resistant as well as delivering pleasant comfort of wear. A special inlay cushions your steps, expels moisture and exerts an antibacterial effect. The boot also contains an absorbent fleece insole and a separate heel cap to prevent any malposition of the feet. The Vibram sole of the Nebraska Pro is particularly slip resistant and dirt repellent. It also provides outstanding insulation against the heat and cold. Your feet will stay warm, even after hours of standing on chilly floors, without the need to wear thick socks. Liquids, oil and petrol are unable to penetrate the HAIX Nebraska Pro. A PU layer cushions your steps and helps prevent pain in the joints and back. The brown sole of the boot is completely colour fast and will not leave any ugly marks. The Nebraska Pro is a great option for mountain enthusiasts and gardeners alike. Your feet will feel equally fresh on rainy autumn days and at the height of summer. 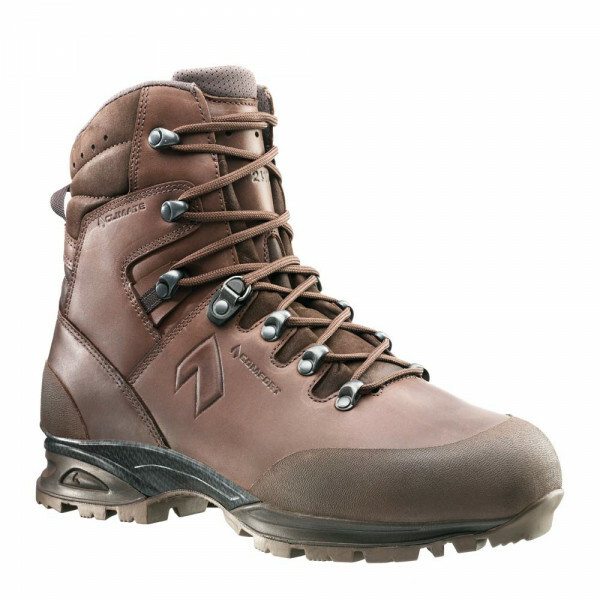 Order your Nebraska Pro boots now and look forward to your next Alpine trip!